When I saw Susan B. Anderson’s new pattern collection of woodland creatures in Knit Simple, I knew I had to buy a copy. Sure, I already have her book, Itty-Bitty Toys, and no, I haven’t made anything from it. YET. But I did help a student of mine make the super adorable giraffe–and we crocheted the spots, so I think that counts! 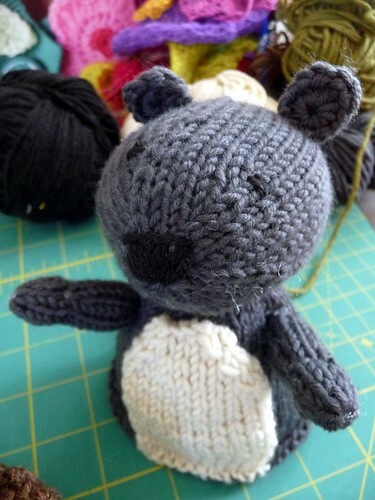 This reversible Hedgehog/Squirrel (that’s a ravelry link, here’s my project page) was too much cuteness to resist. Plus, I had a couple of brown skeins of Berroco Pure Merino in my giveaway pile! I had to buy a couple more skeins (grey and off white) to make the squirrel, but hey, sometimes you gotta Re-stash in order to De-Stash! 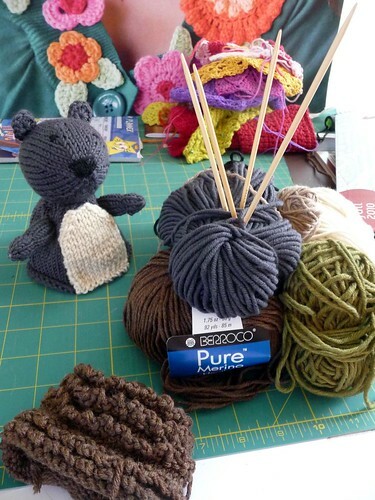 Hmm,it looks like the squirrel worships yarn. Hey, me too! I started knitting the hedgehog. In one night I made the head and half of the body. The body is the brown thing you see on the left. You might be wondering where the head is, and so am I! We have turned the house upside down looking for it, to no avail. Maybe it’s at the bottom of the dirty dishes in the sink, or maybe I accidentally threw it away? It’s driving me crazy because I rarely lose things, but I know that the only way to find it is to make another head. I’ll surrender to that soon. Why yes, I did crochet the ears! I worked on Mr. Squirrel yesterday while staying with my mom at the hospital. She had what was probably a “minor” surgery in the scheme of things, but she’s my mom and it was scary anyway! One of the first things she asked after she came to was where my knitting was. I think she was happy for me to sit and knit so she didn’t have to talk, and knitting made 8 hours at the hospital go by a lot faster. I got a good portion of Mr. Squirrel done during the day, and everyone who saw me knitting it made sure to ask about it. I remember being totally mesmerized by ladies working socks on size 1 DPNs on the NYC subway, so I felt like a total rock star working my DPNs on this squirrel. I still need to make his feet and tail, and then the hedgehog needs a new head (argh), ears and probably arms. I’m not sure yet, but I might keep them separate so I can enjoy both of them at one time…but then again the idea of a reversible is just too cute to resist. We’ll see! I love the little critters. Wow Linda! You are fast! That would take me a month of Sundays to finish. I am so jealous of people that can knit and crochet so fast. Maybe I will take on this squirrel/hedgehog project too.